We have had an interesting couple of days at the banding station this week. We watched a cold front sweep across the central and southern US for several days, encouraging millions of migrants to make long nocturnal flights down the Mississippi valley and across the Gulf of Mexico. The front had cleared the coast of the Carolinas by yesterday, but had stalled in central Florida and was not going to give us relief from the summertime heat and humidity of Miami. Still, birds were on the move and they spread down the Florida peninsula over the last two nights. Some showers overnight from a passing tropical wave caused quite a few birds to land at Cape Florida today. This is a good link for watching migrating birds on radar; they can be seen as areas of blue and green that bloom after full darkness. David La Puma has written an excellent introduction to following bird migration on radar here. We banded three new species for the season today. Above is a hatching-year female Cape May warbler, one of the plumages that gives identifying fall warblers such a bad reputation. The male is more distinctive with yellow streaked underparts and a trace of the reddish cheek patch, but the female can be mistaken for several other species. Several Magnolia warblers were onsite today, and we banded three. These small birds have a distinctive tail pattern that can identify all plumages in all seasons: the white patches are in the middle of the tailfeathers instead of towards the tips. 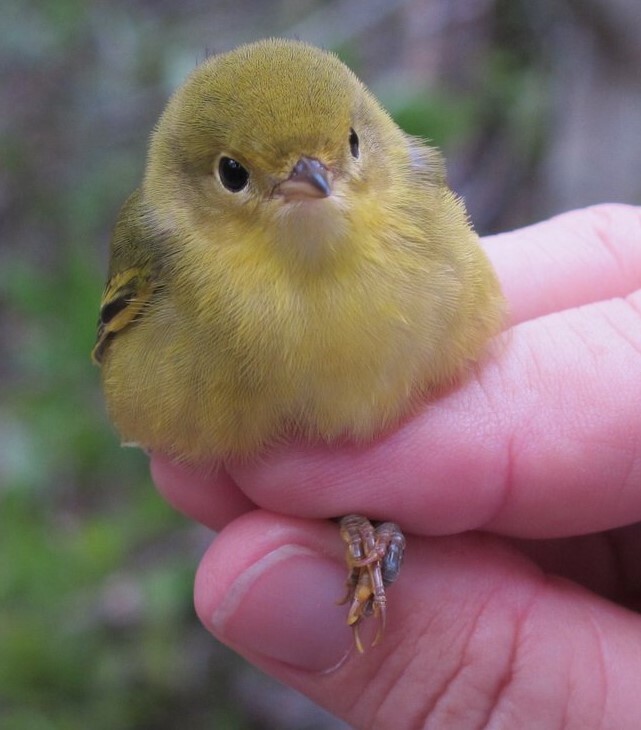 Our final new species for the season was this hatching-year female Yellow warbler. 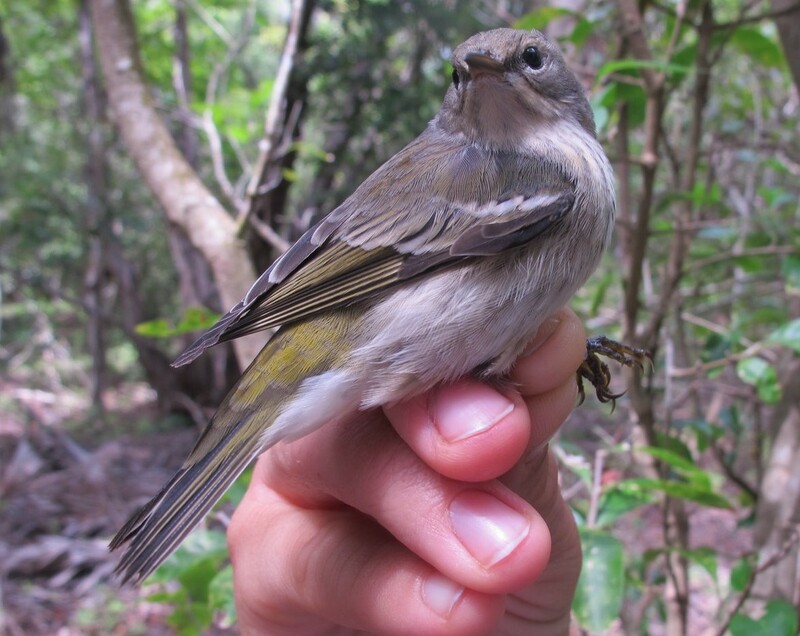 This is only the 6th one banded out of over 23,000 birds since 2002. These are much more common migrants along the Gulf coast than the Atlantic coast as they are headed towards Central America and northern South America rather than the islands of the Caribbean. 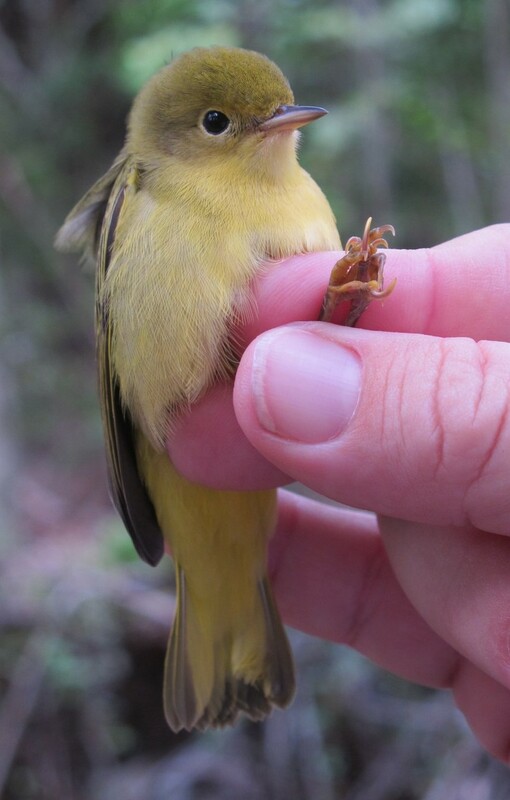 This is the only North American warbler with yellow tail spots. We had distinct waves of migrants over the last two days. Monday was dominated by the first push of Black-throated blue warblers of the season, and a very late Lousiana waterthrush was mixed in with them. 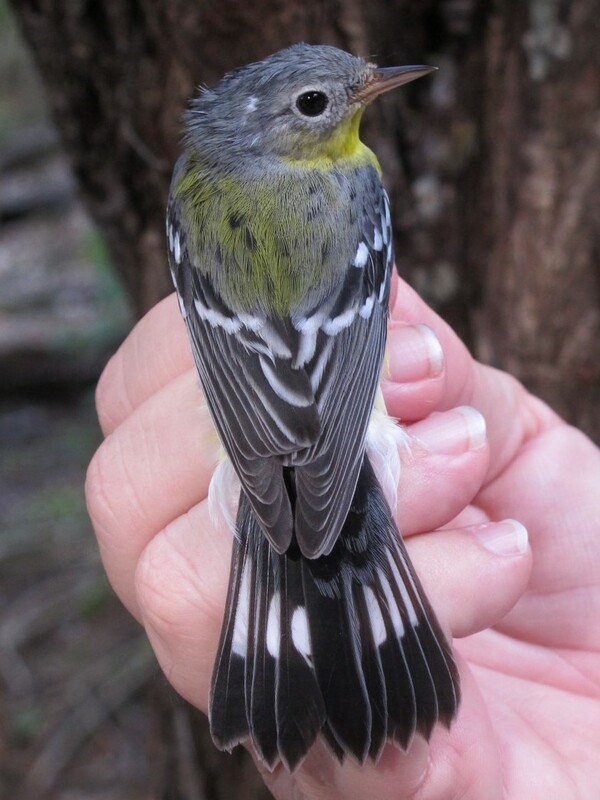 Today Ovenbirds were the most common capture early in the morning, but by 1100 adult male Black-and-white warblers and Worm-eating warblers were flocking in the woods. Some species seen but not captured include Yellow-billed cuckoo, Blackburnian and Prothonotary warblers. Most of the birds banded in the last two days have had great fat loads so they will continue their journey immediately at nightfall if unimpeded by rain. Interestingly, the majority of today’s birds were adults. Keep up the awesome work! Very similar to what we saw in the Middle Keys on September 15. Wishing you a great season! Interesting finds! That juvie yellow warbler is insanely cute. That fall-plumage Cape May should would stump me in the field! Keep up the GREAT work!